Do You Only Dream of Happiness? Dream no longer; forever joy can be yours. All you have to do is sit by the fireplace of your mind, with a warm drink, and absorb the lessons of the most unlikely of sages: Tanaka, a feisty martial arts hermit in the mountain who possesses The 3 Secrets of Happiness. FREE GIFT! The e-book edition of this book is free when you buy GUYTYPES. (You can also buy it here by itself). In mold of The Alchemist and The Teachings of Don Juan, The Three Secrets of Happiness: Forever Joy Can be Yours by Dr. Alexander Avila is a modern fable about a pompous psychiatrist who goes to interview (for his next bestselling book) a mountain hermit, Tanaka, who is alleged to know the secrets of happiness. Stubborn and filled with his own hidden pain, the psychiatrist receives more than he bargained for as he comes under the tutelage of the feisty, yet wise, Tanaka. 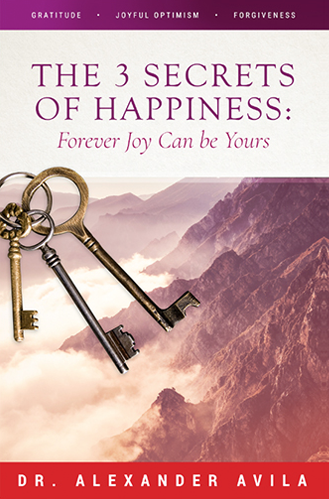 In the end, the psychiatrist abandons his false self and finds peace and love by transforming his destiny through The 3 Secrets of Happiness: Gratitude, Joyful Optimism, and Forgiveness.